Description: This Pre-Calculus class will cover in a full year what a college level course covers in a semester. Topics included are function and their graphs, polynomial and rational functions, exponential and logarithmic functions, trigonometry, systems of equations and inequalities, matrices and determinants, sequences, series, probability, and analytic geometry. Three to four lessons will be presented each week, and the student will be expected to complete and correct each week's assignments, with questions answered at the next class. The student will receive a CD containing the solutions manual, assignment notes, calculator instructions, and graph paper. Assignment notes, help videos, and other supplemental resources will be available online for all students on the CHAT math website. Note: This class will begin at 8:45 a.m. promptly each week instead of 9:00 a.m. Bring your coffee and be ready to hit the ground running! 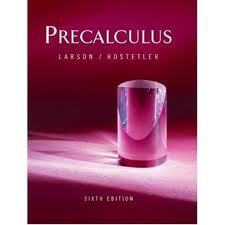 Note: After completing this class, students will be prepared to take the Pre-Calculus CLEP test if they so desire. (For test specifics, see http://clep.collegeboard.org/exam/precalculus.) Questions? Email Mrs. Nelson (address above). Supplies: TI-83 Plus or TI-84 Plus Calculator (silver or color). TI-84 is preferred.